Android’s new Instant Apps are one of the most exciting developments for mobile phones in years. For a long time, when accessing websites on your phone, you’ve had to choose between browsing via a mobile site or installing an app. Mobile sites can be clunky and don’t offer the most mobile-friendly features. But installing apps uses data if you’re on-the-go and takes up storage space on your phone. What if there was a better way? With Instant Apps, you get the best of both worlds. This new feature allows you to use the essential parts of a site’s app without downloading any apps from Google Play. A brief on-the-fly download enables you to use a native app for quick tasks, then close out of it when done. Sound cool? If you have a device running at least Android 6.x Marshmallow (support for Android 5.x Lollipop is coming soon), you can try Instant Apps right now. They don’t work on all devices, and more functionality is coming in Android O, so stay tuned if your device is left out at the moment. Open the Settings app on your phone and scroll down to the Google menu. In this section, look for Instant Apps on the list. If you don’t see it, your device isn’t compatible with them yet. Tap Instant Apps and then slide the top slider to On. You’ll see a brief notice about what Instant Apps do. Tap Yes, I’m In to accept. Now you’re ready to try Instant Apps. For now, only a few apps work with this new service, including Vimeo, Jet, dotloop, and Realtor.com. Let’s try it with Jet. Use the Google Now widget or a new Chrome tab to search for “Jet”. 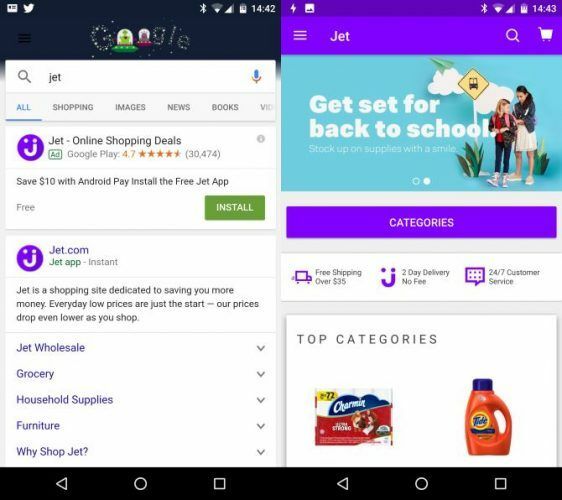 Below any ads, you should see an entry for Jet that says Jet app — Instant. Tap this, and you’ll see a quick download screen that grabs the necessary elements for you to run the app. Now, you’re effectively running the app without having it installed! Drag down your notification bar and you’ll see a lightning bolt icon for the Instant App. Click Go to Web to visit the mobile website instead, or App Info to see a bit about the full app. You can choose Install here to download the full app if you like. As this feature grows, it will become even more awesome for Android in the future. Instant Apps mean that developers can offer the best features of their apps to anyone visiting their websites. You’ll see less annoying prompts to download apps on every other site. And those with smaller phones can use a variety of apps without taking up too much storage space. Have you enabled Instant Apps on your phone? Which ones have you tried? Let us know your thoughts about this innovation down in the comments!